A position determined by crossing lines of position obtained at different times and advanced or retarded to a common time. 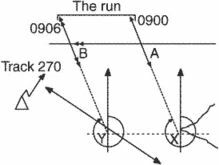 Running fix obtained from a transferred position line and a normal position line. i. A fix determined from a series of position lines based on the same object or body and resolved for a common time. In this case, one or more position lines are transferred to cut another position line at a common time to obtain a fix; the intersection of such lines is known as a running fix. ii. A fix obtained by transferring one or more position lines to cut another position. It was important because it gave us a running fix on the microstructure of our gray iron and gave us a feel for where the iron might be trending," said a former melting supervisor in a high-production gray iron foundry.